Three watersports for getting fit in 2014. Everyone visiting or living in the Turks & Caicos Islands can take advantage of the surrounding ocean and watersports opportunities available. Regardless of age, we all want to get the most out of our lives, and being fit and in shape helps us maximize our potential and feel good about ourselves as we accomplish our everyday goals. This article highlights three popular TCI watersports that give you a full body workout, along with their physical and mental benefits. The greatest aspect of all three is that you can make it a solo session, or go out with a group of friends and share the stoke! Each has unique features and all can be taken at your own personal pace and intensity. 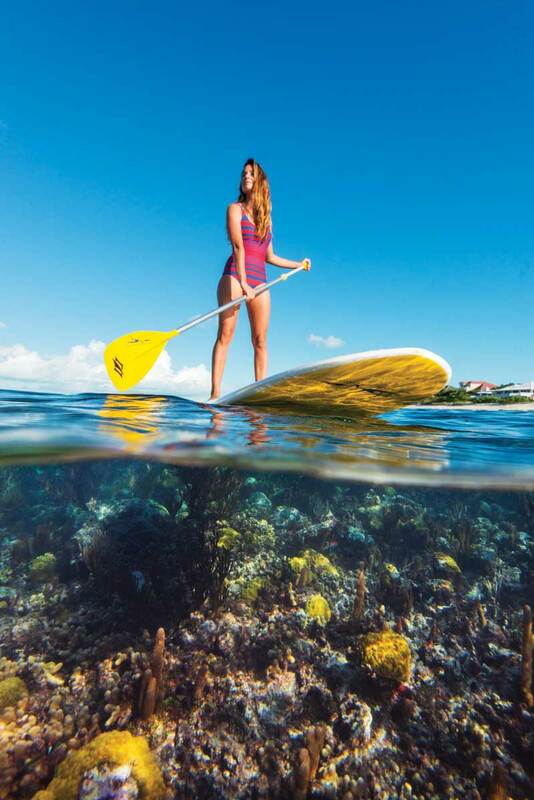 Besides being good exercise to develop core muscles, stand up paddling offers a heron’s view of TCI’s underwater realm. There really is something behind the latest craze in watersports: Stand up paddling (SUP). It is a very simple sport to learn and requires no previous skill. It is versatile and can be done on any body of water, flat ocean or waves. Calm weather is the ideal condition to paddle, although SUP downwinders with the wind to your back are super- fun! You can paddle as fast or slow as you like and rest without feeling like you’re losing distance as the wind continues to blow you along! Physically, stand up paddling is great for toning and developing muscles in a low impact way and improving balance. Using the basic stroke technique, the deltoids in your shoulders, as well as muscles in your stomach and lower back are constantly being strengthened and toned. Paddling is also a great way to develop your abdominal muscles if you strive for a “six pack.” It’s important to strengthen all these muscles as this will help prevent future injury from everyday accidents or strain. As you develop your SUP skills, you can change the intensity of your paddling to increase your workout. It’s always good to set simple, attainable goals for yourself, increasing them as you feel comfortable with your progress and what you’ve achieved. 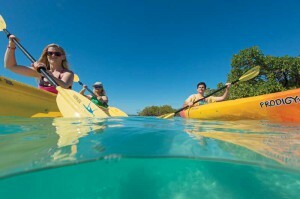 Mentally, paddling is great for releasing stress and a good way to get out and become familiar with the native wildlife and fish species of the Turks & Caicos Islands. Standing up gives you a high vantage point, and you can see juvenile turtles, fish and conch through the clear waters. Another great area to paddle is the mangrove reserves around Providenciales, which are home to exotic species of birds like herons, egrets, and pelicans. Gliding around the bushes and resting places of these birds in their natural habitat is both magical and calming. Overall, stand up paddling is a great recreational watersport for people of all ages and abilities. The boards are light and easily transported in cars, on roof racks, or in truck beds. If you are considering buying one but don’t have space for a large board, consider an Inflatable Naish SUP. These fit easily into a backpack and are simple to store and transport, wherever your travels take you. There’s no excuse! Kayaking equally develops the shoulder, arm and core muscles on both sides of your body, and offers a “stealth-like” approach to birdwatching. Kayaking is quick to do and requires no set-up time. It’s a great aerobic cardiovascular exercise that increases the demands on your upper body and in doing so, develops the shoulders, arms and core muscles. As you kayak more frequently, your legs will become more important in the rotation of the torso, and with the correct technique and a well-executed stroke, chest muscles and the thigh and leg muscles will be strengthened. And the best part? This all happens while sitting down! Kayaking is a well-balanced exercise tool because you’re equally using muscles on both sides of your body. Similar to stand up paddling, it’s a low impact sport with little wear and tear on your body and joints, yet great for increasing aerobic capacity and endurance. Kayaking gives a feeling of gliding across the water, and offers a “stealth-like” approach for bird watching, as your low visibility is less likely to frighten herons and egrets perching and nesting in the mangrove branches. Surprisingly, kiteboarding does not require great arm or shoulder strength, and Long Bay is an unbeatable place to learn. 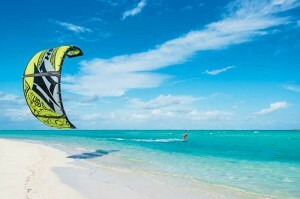 Kiteboarding is the highest impact choice of the three sports, but free-ride kiteboarding is very easy on the body. You can adapt kiteboarding to your own comfort level. For example, one of my friends recently had hip replacement surgery and was back on the water kiteboarding within six months! There is a misconception that kiteboarding is only for the young and fit, and this is totally wrong. I started kiting when I was eleven, while Terri Tapper and Randy Hall took up the sport in their forties and fifties. Kiteboarding is for all ages! It helps younger riders develop independence and responsibility, but it’s never too late to learn! The workout from kiting is mostly on your legs, as you use them to edge the board in the water against the wind. Kiteboarding doesn’t require arm or shoulder strength, as the power from the kite is held by a harness around your waist, and the kite itself can be flown with just two fingers. The more you ride, the more your hamstrings and quads will develop and become toned and strong. The constant edging of the board also helps to increase the endurance levels of your leg muscles. Kiteboarding requires more dedication and practice to learn than SUP or kayaking, but challenges help us to constantly develop ourselves. Long Bay is an unbeatable place to start kiting, as the warm shallow waters allow you to stand at low tide for easy kite control, and the wind is clean and consistent, having blown over the Caicos Banks with no disruptions. It is truly a word-class location to learn to kite. It’s almost too easy! The special part about kiteboarding for many people is the sense of freedom and the ability to rig up and ride anywhere, anytime there’s wind. Learning to jump and literally floating through the sky is an unparalleled experience and one that all kiters can’t wait to do again and again! You feel weightless and are truly living in the moment—nothing more than the next ten seconds matters. I hope this article and pictures have encouraged you to try one or all of these watersports! All three are an amazing way to explore the beauty of the Turks & Caicos and a chance to enrich your life and take advantage of what the Islands offer. There is no negative environmental impact and it’s a way to get healthy while you appreciate our “Beautiful by Nature” environment and beaches. If you need any more encouragement, just step outside and take a deep breath of the sea air! Big Blue Unlimited offers kiteboarding lessons with certified instructors and daily stand up paddleboard and kayak tours. They also rent boards and kayaks for a self guided adventure. Blue Surf Shop sells natural, environmentally friendly sunscreen and UV protective rash guards and sun hats to protect your skin from burn and excessive UV rays while enjoying the outdoors. To avoid the sun and heat of the day, stand up paddling at sunset is a peaceful way to enjoy the surrounding beauty in a calm, meditative liquid aura. See you on the water! Hope LeVin is twenty years old and has spent her entire life in the Turks & Caicos. She is a sponsored kiteboarder riding competitively for Big Blue Unlimited, Naish Kiteboarding, Visit TCI, Blue Surf Shop and Ride Engine. Follow her at www.hopelevin.com.